Home > Tutorial > How to create video postcards from footage or webcam? How to create video postcards from footage or webcam? This guide is mainly about how to create video postcard from footage, with this software, you also can capture video from webcam, make youre special video postcard. 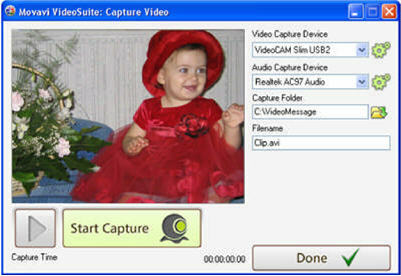 To do this you need Movavi Video Suite, you can download the software free from here, for more features about the software, you can visit here. For more features guide about Movavi Video Suite, you can refer this guide index. Note: Becaese Movavi Video Suite is a very powerful pack (36.55 MB), it may take a little long time to download it. Step 1. Open the video you’d like to use. Step 2. Choose a frame from the Frame box. Your selected video will appear in the Preview area. Step 3. Choose '320*240' resolution (for smaller size) or '640*480' resolution for better image quality (but remember that this will create a larger file). Step 4. Type your message in the Text Message area. Step 5. Choose a still shot for your postcard by moving the lower Seek slider. Step 6. Click Start to create your video postcard. After you've successfully created your video postcard, you can: play the message at your computer; save the message to your computer for future sharing; send the message to your friends right away! Step 1: Capture video from your webcam. 1) Connect your web camera to your computer using a USB cable. 2) Select the folder where you want to save your captured video. 3) Click Start Capture to start shooting your video greeting. When you’re finished shooting, click Stop Capture. 4) Preview the captured video to decide whether you are happy with it. To do this, press the Play button. Note: if you are not satisfied with the captured video, just click Start Capture to shoot another video. 5) Having shot the video you want to use for your video postcard, click Done. You video will automatically open in the main window of the Video Message module. Step 2: Create your video postcard. 1) Choose a frame from the Frame box. 2) Set resolution: '320*240' (for smaller size) or '640*480' (for better quality). 4) Choose a still for your postcard by moving the lower Seek slider. 5) Click Start to create your video postcard.